If a tree falls in the forest, and no one is near to hear it fall, does it make any noise? A simple, though philosophically thought provoking question as to the relationship between what an individual witnesses in their life, and the events of the world going on outside the range of each being’s five senses. As you read that, a tree has been felled. The noise is tremendous; though you, the reader, did not hear it, it was surely heard by the gorillas of West Africa, the ocelots of Brazil, the harpy eagles of Guyana, the orangutans in South East Asia, and on and on throughout the forests of the world. They scatter with fear from the sound of the loss of their home and their species as they’re driven to extinction. On the corner of Warren Street and River Terrace in downtown Manhattan over on the west side at Battery Park City, stands a sculptural replica of a meditation temple one may encounter in South East Asia. The location of this sculpture clearly denotes it is not intended for meditation. Its foundation is made of 5 layers of granite blocks in a 15-by-15-foot square platform, with five little steps to the top plateau. An oriental style roof covers the entire foundation and is suspended about 15 feet in the air, held up by12 teak pillars. Another tree has just been felled. This time it was for the aesthetic of a faux temple, whose only occupants are evidently pigeons: the flooring of this open-air gazebo is caked with bird defecation. Teak, as a construction material, has been illegal to use by New York City and state agencies since 1991. Most of the world’s teak comes from Burma. Burmese citizens and Burmese Monks have been beaten, tortured, and killed directly due to the industry of logging as it exists in this South East Asian nation. Its government is rated as one of the top two most corrupt regimes on planet Earth. A resident of New York City walks by the faux temple, unaware of the implications related to the presence of this minor artwork. Meanwhile, a monk is taken forcibly from his temple and made to work in the forest for no pay on orders from the military, who through the government get payoffs from logging companies to extract the precious lumber. Deforestation and devastation of wildlife are the immediate results. Surely, this is a sad irony. 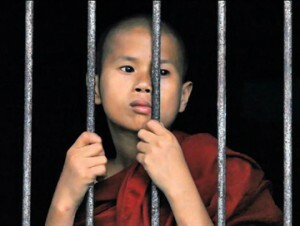 The whims of a world power supporting an oppressive regime in Burma. Currently, a military junta continues to rule Burma while holding Nobel Peace Prize Laureate Daw Ang San Suu Kyi under house arrest since the last democratic elections were held in May of 1990. She represented the National League for Democracy (NLD), which won the election with an over-whelming 82% of the parliamentary seats, though she was never able to govern Burma. The original military coup took place in 1962. A pro-democracy movement in 1988 was squashed by massacre. The State Law and Order Restoration Council ruled with an iron fist while the world watched. Another tree is felled, . . . . . Did you hear it? In less than one hundred years Burma has gone from 80% primary forest to approximately 20% undisturbed forest cover. It has the third highest rate of deforestation after Brazil and Indonesia. Deforestation is intrinsically linked to Climate Change and Global Warming. “Green” is no longer just a color. “Going Green” should not become just a slogan, but remain an understanding of the relationship between the self and nature. “Sustainability” is not only a word. It is a practical working philosophy of acting to create systems that do not exhaust themselves into extinction. 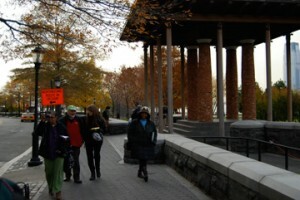 Battery Park City Parks Conservancy claims they are the “greenest” community in the country. But by what standards? Not only is teak used as part of the faux temple, a teak railing runs along the top of fencing north of the Battery Park Marina. Just south of the marina are block benches made of teak. They exist despite New York State legislature banning use of this wood in 1991. Another tree is felled unnecessarily. There are numerous solutions and numerous alternatives present today to create a truly “green” city. From recycled plastic lumber (RPL) to sustainable systems working with nature, to the localization of product creation and consumption, the answers are ever present. The leap to effective society with effective governance comes with a conscious public making conscious decisions and acting before every old growth tree is felled, and every primary forest a memory of our collective mind. Go to Rainforest Relief’s “Teak Is Torture” report. Please contact the Battery Park City Parks Conservancy and tell them that their brand of “green” doesn’t seem to include tropical rainforests, the most lush places on earth. 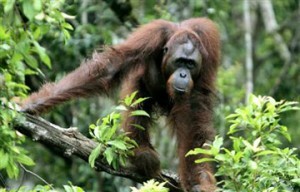 Kapur is being logged from old-growth rainforests in Indonesia, mostly illegally. Logging there is wiping out the last rainforests of Indonesia, home to the highly endangered orangutan and thousands of other unique species of wildlife. The trees are from 250 to 1000 years old. The IUCN Red List of Endangered Species lists kapur (Dryobalanops aromatica) as Critically Endangered.